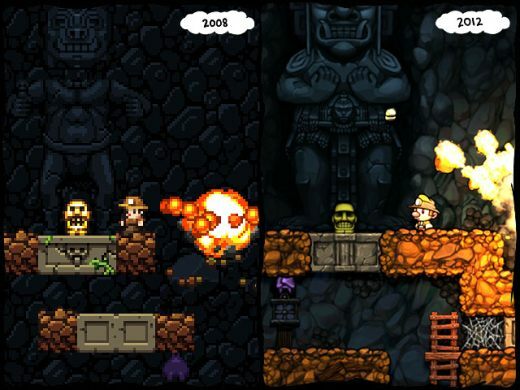 Spelunky was definitely one of those games that I avoided like the plague because I hated the look of it: cartoony characters, basic 2D platforming, flaccid whip. Lame. I attributed its popularity mostly to video game nerds geeking out over the retro-ness of it (it’s a remake of an old Microsoft freeware game). But it was hard to ignore. People kept talking about it, whether it was on podcasts or gaming news sites; even Twitch was filling up with Spelunky “daily challenge” feeds. So I finally caved. I bought it for the PS Vita at some ridiculously low price (I don’t think the PSN people had really caught on to how popular it was yet) and tried to get into it, if only to validate my apathy. At first, it was frustrating. The controls felt clunky and the amount of things that could kill you–like THROWING ROCKS AT YOUR OWN HEAD–was absurd and felt completely unbalanced. But people kept talking about it. So I went back and took it slow, avoiding the “run” function and just trying to get a grip on the controls. Eventually, I stopped worrying that something was going to kill me every time I jumped to something on the edge of the screen. I memorized how much space a bomb cleared out, how far a rope reaches upwards. Okay, this isn’t so bad. I’m getting pretty far ahead by now, reaching about halfway through the jungle levels (the second area), when I accidentally blow up a cliff to reveal a hidden door, something that doesn’t exist anywhere else in the game. WHAT. I walked through it and the whole game changed. I had found the black market, the place where the game basically turns on its head. I won’t go in to too many details for fear of spoiling things for anyone who hasn’t found it yet, but suffice it to say, the entire game will change for you once you find this area. Okay people, this might not seem like a big deal. It might even seem really obvious to a lot of people when you tell them you’ve been playing a game where the levels look different every time you play it. But to me, this sentence might as well have read “the game is writing the game as you play the game.” Basically, “the game is alive.” THIS IS SO COOL. LOOK AT THIS. LOOK HOW COOL THIS IS. You might call me naive, or even just lean back and smile at how innocent I am for not knowing about this before, but I think we have to consider the context here. 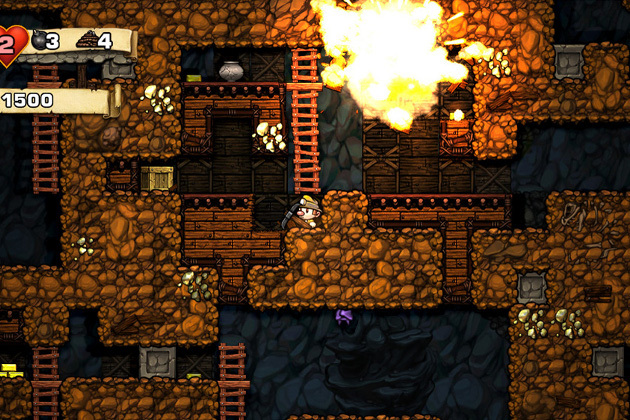 Spelunky is an amazing game when you get into it. It’s action-oriented, smooth, and has great level design; it has clear goals (reach the end) and unclear goals (get to Hell); it’s an arcade game but through the items system your character grows and gains new abilities. This is not Tetris-random; this is big-bang-creating-suitable-environment-for-humans-to-flourish-random. Nothing about this game feels “random” and maybe that’s why it took me so long to think about how the game was programmed. The levels always seem to have a flow to them, moving from the top to the bottom with a lot of sideways. The enemies never feel like they’re over-grouped or too sparse. The environmental hazards, though they increase in difficulty as you go on, never seem to disappear completely or group together so close that it’s basically a bed of needles. I am genuinely amazed at the logic that must be controlling that type of level-generation. So how does this all tie in to the black market? The obvious answer is that the entrance to the black market is different every time, making it even more exciting when you do find it. The less obvious answer is that, through the black market you can access parts of the game that are impossible to access any other way. This also means that your score will change (high scores are determined by time and amount of treasure collected). When your score changes, whether higher or lower, you play the game differently. The whole point of these arcadey-type games IS to get the high score, after all. In other words, finding the black market literally changes the way you play the game. Add this to the fact that the game changes the way it even EXISTS and you have an experience that will for sure be 100% different every time. I can’t say that’s true for many other games that feel this deep and complex. Anyhow, I realize that I haven’t actually explained anything about procedural generation and that’s because I really don’t know much about it, only that it’s a fascinating concept that I’m definitely going to explore more in the future.